Cruise passengers are often unsure as to what is actually included in the cost of their holiday, and so we’ve put together this handy guide to help you understand just what your options are when it comes to complimentary activities. Whether you are sticking to a strict budget, or can comfortably splash out on various excursions and dining experiences, it can be useful to be aware of what has already been taken care of in the price of your cruise. Read on to find out more about what we feel are the top – complimentary - things to do onboard. Today, entertainment onboard cruise ships is of such quality that guests often compare shows to those seen in the West End or Broadway. 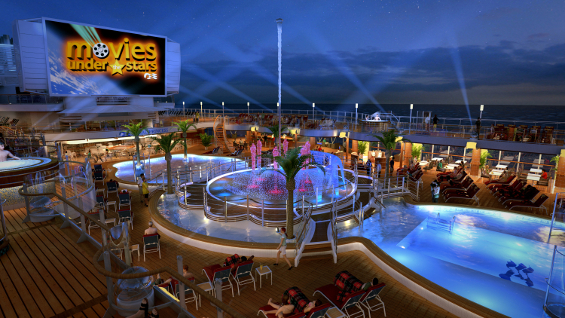 Depending on the cruise you are taking, options may include musicals, acrobats, magicians, singers, dancers, and more. Witness incredible talent in the evenings of your holiday, and even take part on some nights, such as on the Strictly Come Dancing competitions on selected P&O Cruises. Most ships offer an abundance of choice when it comes to activities to try in the day time. From Carnival Cruise Line’s amazing elevated bicycle experience – the Sky Ride – to rock climbing walls and surf simulators on a range of ships, there will surely be something new for everyone to try. These activities are complimentary, unless you decide to book a lesson with an instructor. Be aware that various exercise classes can also sometimes have a small surcharge. Whether in the comfort of your cabin, in one of the indoor movie screens, or at the outdoor Movie Under the Stars venue on Princess Cruises, there are usually plenty of options when it comes to watching all sorts of films. Settle down in a comfy chair with some drinks and popcorn and relax with your loved ones to watch a movie in this unique setting. Almost all cruise ships have at least one pool onboard, with most tending to have a variety to choose from - including kids pools and designated adult-only areas. Use of the pools is included in your cruise fare, or, if swimming is not for you, relax in the surrounding deck area on comfortable sun loungers. The Dr Seuss-themed Waterworks on Carnival Horizon is a particular favourite for families. There is no need to deprive yourself of traditional British comforts while on a cruise holiday. Teas and coffees are complimentary on most ships, with some lines such as Regent Seven Seas even offering a daily afternoon tea experience which includes an impressive array of sandwiches and cakes. Be sure to find out where to head for your all-important tea break early on! Passengers can keep up with their health and fitness not only by taking a swim, but also by using a range of gym equipment including treadmills and weights, or even take a morning jog or after-dinner walk around the deck. There are a great many opportunities for those who enjoy a workout – see our blog about keeping fit onboard to find out more. Even if you don’t care for swimming, you may wish to don your bathing suit to enjoy some time spent relaxing in the gentle, onboard Jacuzzis and whirlpools. These can be especially appreciated after a long day of excursions, as they are perfect for unwinding and soothing aching feet after a walking tour. 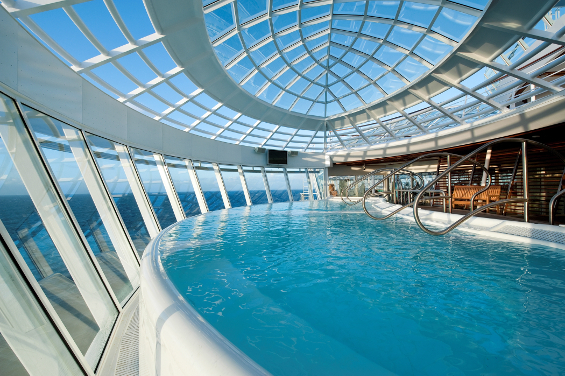 The cantilevered whirlpools on selected Royal Caribbean ships in particular, offer outstanding views of the surrounding ocean. Specialist onboard restaurants generally carry an additional surcharge, but it should be noted that you can have a fine-dining experience without visiting one of these. The menus to be found in most main dining rooms are extensive, and boast a superb quality of meals. Certain ships may have a number of additional complimentary restaurants; Norwegian Cruise Line’s Jade has six different choices. Some truly spectacular views are bestowed upon cruise passengers, from colourful sunrises and sunsets, to staggering landscapes, to the ocean’s magnificent creatures. Be sure to take your binoculars and a camera with a decent zoom in order to capture the amazing things you will undoubtedly see. Experiencing the ocean’s natural wonders has been taken to the next level, on selected Ponant ships, with the installation of underwater lounges. Cruise ships have been developed with the utmost care, with the styles and personalities of its prospective guests always in mind. Depending on your holiday type, ships might be furnished with all kinds of complimentary opportunities for spending time in, such as libraries, art galleries, and piano lounges. You can also attend live cookery classes on some ships, such as the Saga Pearl II on which celebrity chef Omar Allibhoy demonstrates his skills. Make sure you spend some time looking around your ship to ensure you can enjoy all it has to offer.